Wait, sorry, that’s the wrong movie franchise. But there’s no doubt about it—Hot Toys’ take on The Force Awakens’ shiny new Stormtrooper Captain is quite literally rather dazzling. Somehow, we’re in month two of the Force Awakens merchandise extravaganza, and yet this is the first Captain Phasma toy I’ve seen that actually replicates her stunningly silvered armor with metallic paint—and just how much of a difference that actually makes in turning a good Phasma figure into a truly great one. I mean, just look at her. You almost want to put her on a colored light stand and turn her into the First Order’s finest disco ball. For even such a relatively plain figure, Phasma is packed with some fantastic detailing, from wear on her cloth cape to the scuff marks on her helmet. Captain Phasma was already a spectacular design in the first place, and we’ve had some truly lovely toys that represent that design over the past few months. But Hot Toys, as they do with most things, has really knocked it out of the park here. There’s some shots where you forget that it’s an action figure, and not Gwendoline Christie posing for a photoshoot. The 33cm-tall Phasma doesn’t come with many accessories—she has her equally shiny blaster rifle and and many alternate hands with which to hold it and pose with it—but honestly, she doesn’t really need much more than that to look fabulous. Maybe, if your wallet allows it, a couple of Stormtroopers to flank her. That’s all you need. 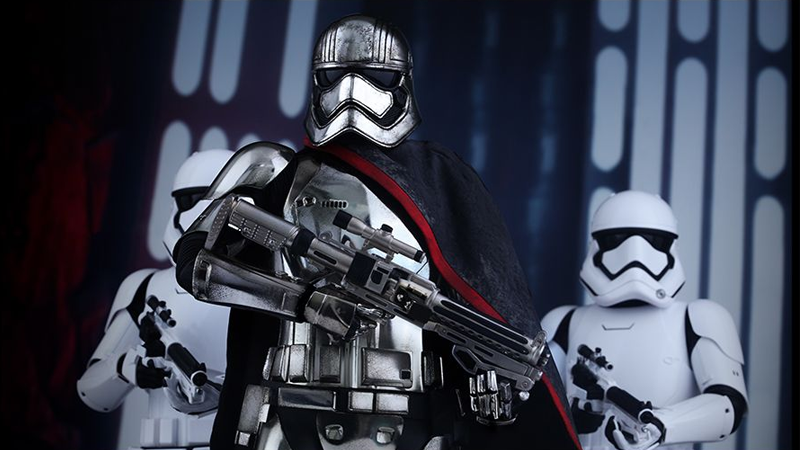 Captain Phasma will be in the middle of next year, and will be available for purchase soon on Sideshow Collectables’ webstore. There’s no price revealed just yet, but expect the usual Hot Toys price of around $200-225.